As a growing number of deep-pocketed big brands are spending more to advertise across the social network, Facebook’s advertising revenue grew by 43% year-over-year to $3.8 billion in Q2, while about 76% of the revenue came from mobile, or $2.9 billion. The world’s biggest social network said its revenue jumped 39% to $4.04 billion, it is believed that it is the fresh evidence of its allure to big brands, as it and Google increasingly take the lion’s share of the fast-growing mobile advertising market. 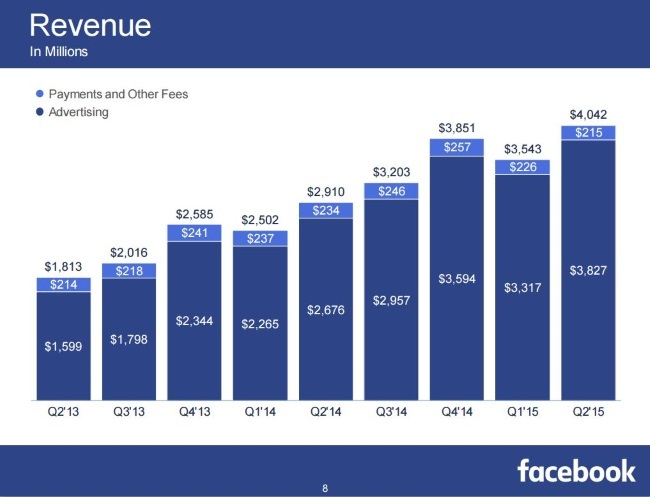 Marketers aren’t using Facebook ad products less, according to its latest earnings report. 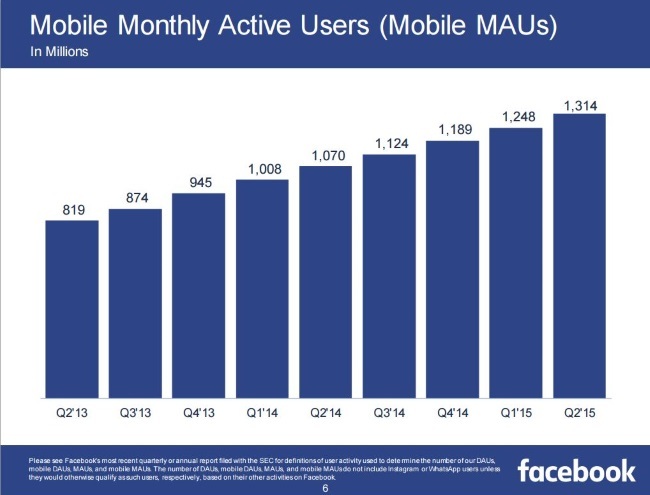 Mobile made up a huge 76% of advertising revenue, up from 73% last quarter. Mobile monthly users grew 4.8% to 1.31 billion from 1.25 billion, and mobile daily users grew 5.76% to 844 million from 798 million, both a little slower than last quarter. 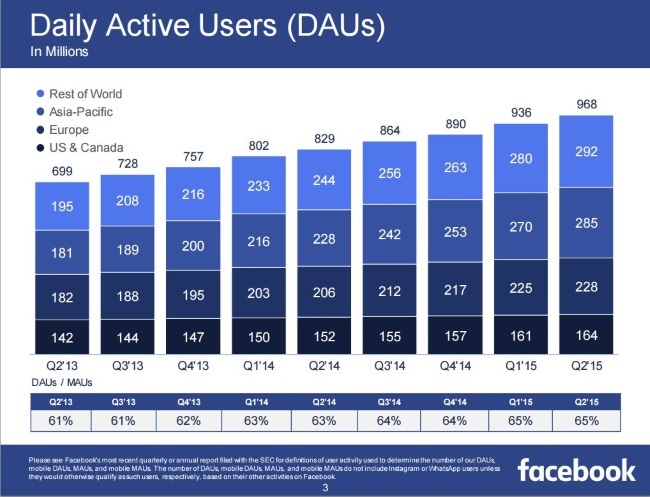 Daily active users hit 968 million, up 3.41% from 936 million. While over 2 million advertisers are buying ads on Facebook, “We continue to innovate at a rapid pace, introducing new ad formats and new tools for advertisers,” chief operating officer Sheryl Sandberg said during company’s second quarter earnings conference call. Facebook is also moving fast to transition the platform from photo-focused to video-focused, putting the Internet company in a better position to own a piece of the lucrative video advertising market. To that end, Facebook earlier this month announced its first video ad revenue split with a select group of high-profile publishers. “For marketers, video has always been a compelling format. Now Facebook enables mass reach and cross device targeting and measurement abilities far superior to what other platforms offer,” said Sandberg. She also mentioned mobile video was a major theme at the Cannes Lions Festival last month, where some of the biggest winners, like Under Armour’s “I WILL WHAT I WANT “with Droga5 and Procter & Gamble’s “Like a Girl” with Leo Burnett, used mobile video on Facebook as part of their campaign. When video advertising is a huge market for Facebook, Mark said immersive 3D content is next thing after video, “gaming will be huge, and those are both areas that Facebook has been involved with.” he added. "We believe in doing two things well – consistency in proposition building and 'acts versus ads'. "..